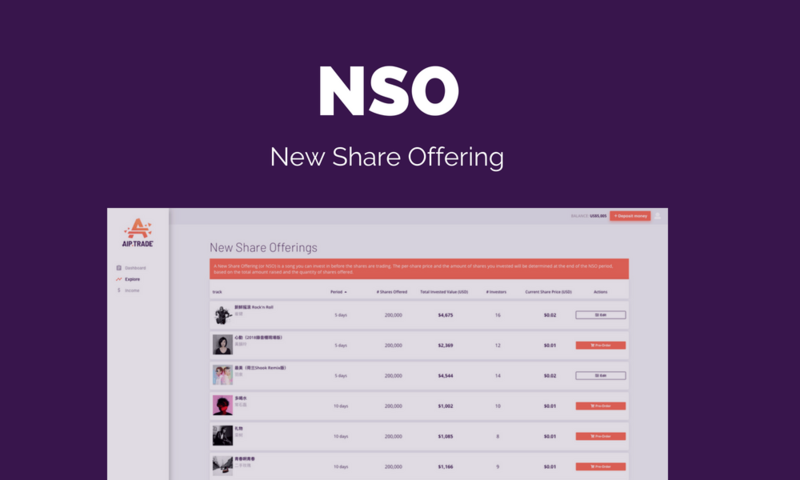 What is a New Share Offering (or NSO)? At AIP, artists, labels, and other song copyright owners can launch a New Share Offering (or NSO) to sell shares of future song earnings to music lovers and investors. Fans and investors that purchase shares can earn from selling their shares to others at a profit, or by collecting annual royalty distributions. Royalty distributions are the shareholder's percentage of the revenue that the song has generated. New Share Offerings at AIP are similar in some ways to Initial Public Offerings (or IPOs) in the stock market. An IPO is a type of public offering in which shares of a company are sold to institutional investors and usually also individual (or "retail") investors, then listed on one or more stock exchanges. Through this process known as “floating”, or going public, a privately held company is converted into a public company. Then members of the public can purchase and trade shares of that company in the open market, as well as collect profit distributions, which are called dividends in the stock world. While NSOs may resemble IPOs in some ways, there are also significant differences. One major difference is that NSOs are launched using a decentralized consensus pricing model. IPOs or ICOs (Initial Coin Offerings) are generally developed in a centralized manner, meaning private organizations—usually in coordination with banks—decide what the first price offered to the public will be. That's right; while most ICOs claim that they are decentralized, the majority of them break their promise. AIP uses a consensus pricing model to define the value of NSOs. That means members of the public who are interested in acquiring royalty shares of a song decide what the shares cost. If fans and investors believe in the new song's potential, they will invest in it. The more money that's invested during the subscription period, the higher the price per share will be when trading launches. The total amount raised will determine how many shares the subscribing investors obtain before trading begins. This is a clear, decentralized process based on the ratio of supply and demand. 1. Copyright owners apply for a New Share Offering launch at AIP. Once the application is approved, we verify important information about the song, like the musicians involved, royalty splits, and more. 2. Next, the NSO is prepared for the subscription period. We work with the song's copyright owner to decide the total amount of shares that will be created for the NSO, as well as what portion of shares they will float to the public for investing (or the initial tranche). For example, an artist may sell 200,000 of 1 million shares, or 20% of the total shares available. 3. The subscription period then goes live 14 days before the NSO is open for trading. During the subscription period, potential investors will submit an amount they are willing to invest. For instance, a fan may invest $1,800 while another contributes $5,000. The NSO price will be reflected in realtime at AIP, updated as and when investors submit their subscription. The NSO price is determined by: the total subscription dollar amount by all investors ÷ initial tranche of shares (e.g. $360,000 ÷ 200,000 = $1.80). Investors who have placed a subscription can increase, decrease, or withdraw their subscription at any time before the subscription period ends. 4. When the subscription period's 14 days have ended, the NSO per-share price will be set, based on the final investment amount collected. The corresponding quantity of shares are then allocated to each subscribed investor, determined by the dollar amount they subscribed. Using the same example as above, a $1,800 subscription is equal to 1,000 shares of that song. 5. The copyright owner will then receive the raised funds and open trading. Subscribed individuals are able to sell their shares to others (or to purchase new shares if available), and newcomers are able to purchase shares at the price indicated. The price of the shares will move based on the demand from these investors and fans. Copyright owners can also decide to cancel the NSO instead, if they feel they didn't raise enough funds. In this case, the shares will not be issued or traded, and all investors will get their funds back. This open exchange activity establishes the value of the song's royalty shares in a fair, transparent, and decentralized process. The amazing potential of public fundraising meets the power of music to cultivate new, exciting profit opportunities for all at AIP!